In Austria – and I am sure in other regions of Europe – people cut a few twigs from a fruit tree (usually cherry, but any fruit tree should work) on December 4th. 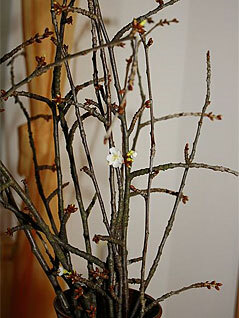 When put into water and kept inside, those twigs will defy the dead of Winter and bloom on, or shortly after, the Winter Solstice. Of course, the twigs have to be cut on December 4th so they actually can bloom by the Solstice, but there is also a deeper spiritual meaning behind that particular day. The day is dedicated to St. Barbara in the Christian calendar, with her own Christian legends of martyrdom and what not. And thus, the twigs are named after her. St. Barbara is, however, also the “replacement saint” for one member of the Goddess Trinity, the one known in the Alps as Werbet or Borbet(h.) She is, among other things, the crone and death-aspect of the Goddess Trinity, the Psychopompos, not unlike the Irish Cailleach. She accompanies the souls of the dead into darkness, into the womb of Mother Earth, whence they are re-born. Therefore, she has often been depicted as dressed in black, and later on she has been associated with an old hag. In some regions, Borbeth is the figure leading the Wild Hunt. As such she is also known today as “Mother Percht,” who visits people’s homes on January 6th, together with the souls of the little children that died the previous year. Folks like me would leave a bowl of milk and bread on the dining room table for them that night. Percht, BTW, may be a dialect corruption of Borbet, who gave name to the German city Worms, which was originally called Borbetomagnus (Great Borbet.) . Because folks in the olden days were already used to call upon Borbet in times of death, particularly in battle, but also during child labor, when the mother’s life was in danger, replacing the Goddess with St. Barbara was the typical scheme by the Church to take over folk customs, at the same time preserving them. The “worm” mentioned with Margaret is an old expression for both the serpent and the dragon. The original meaning of the twigs, since they were associated with the Goddess herself, was that the magic of the All-Mother was so strong she could create live even in the depths of Winter. Of course, the twigs, and what they did or did not do by the Winter Solstice, were used for all kinds of divination. People read the future from the form of the blossoms; between young women the one who’s twigs bloomed first were to find a lover first, or they carved the name of the one they loved into the twig; some families have one twig per family member. Whatever you choose to associate with the blooming of the twigs, they are not only great pieces of decoration during the holidays, but also bring the Goddess into your house. 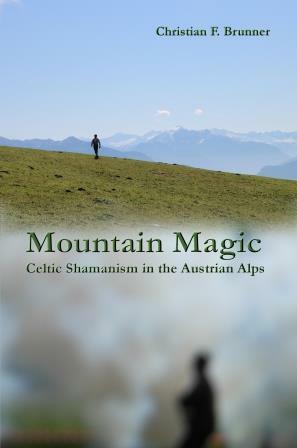 This entry was posted in Uncategorized and tagged austria, Barbara, celts, christianity, Christmas, druid, druiden, druidry, druids, heiden, herbalism, herbs, hexen, Holidays, kelten, kräuter, Mond, Moon, pagan, paganism, Saint Barbara, schamanismus, shaman, shamanism, Twig, Winter Solstice, witch, Witchcraft, witches. Bookmark the permalink. wonderful article, thank you. just one thing: everything works better if in translating, wurm = farm. …your suggestion of it meaning “farm”. Which we would call “Bauernhof”. Also, St. Margaret is often depicted as standing on a serpent, or leading a dragon on a chain…if you Google “hl margarete” and choose images, you’ll see a lot of pictures of her with a dragon. yes, i think it belongs to a sort of continuum of similar words of the time occuring in different areas in western europe with surviving forms in french and english. i see semantic changes around the outside of its range. farm, ferme, forum and furrow branching off to become fur et al because of celtic initial letter mutations, ferme becomes worm very easily in rapid speech, and in extant celtic languages that’s according to strict grammatical rules. as for semantic shifts, farm easily becomes the word for worm, because that’s where they are so plentiful. then people unacquainted with farms, learning by reading, easily mistake a description of a worm for a description of a snake or serpent, and so the myth grows. it’s a lovely myth. i imagine the pictures of her might have been illustrating accounts of her long after they’d morphed, through mistakes, into myths. but mostly, the triad you have is more regular if wurm means farm, and relates the three women to practical reality, since the tower represents bureaucracy and the wheeel industry, perhaps via spinning yarn, which to me is beautiful.